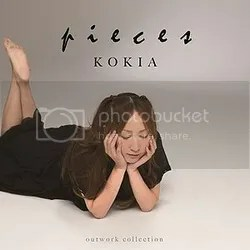 pieces is an outwork collection album by Japanese singer KOKIA, released on August 24, 2011. Most of the tracks were originally on various soundtracks. The album reached #62 on the Oricon weekly charts where it charted for 2 weeks. I was actually blown away by KARMA, it’s such an impressive song! I know some of KOKIA’s work, not everyhing, but I didn’t expect this epic and haunting song. Obviously it was the intro song for an anime (Phantom ~Requiem for the Phantom~ to be exact) and KOKIA paid a good tribute to the anime by adding a lot of ad-libbing and chants to the song. I’m totally into this. Insonnia was the B-side for the previous track (first we’ll get all the A-sides and B-sides in their exact order of release, fyi). What I like about this is that it shows KOKIA’s talent for languages, since the entire song is sung in Italian! Very nicely done, still it’s a bit like a lullaby song and that’s always quite risky in the first part of an album (I always say so haha). Sooo… I nearly fell asleep but nonetheless it’s soothing and beautifully sung. KOKIA made another song for Phantom ~Requiem for the Phantom~, and it’s called Transparent. For an anime song, it’s quite peaceful and it doesn’t have many highlights, at least during the first parts of the song. It has a sense of mystery surrounding it because of the arrangement, I think it’s very well done only the chorus could’ve been more inviting. Chinmoku has quite a long intro with soft chants in the background and a piano playing to distant percussion. I find it hard to keep paying attention to the song to be honest, since it’s so soft and soothing. That doesn’t make it less pretty, it actually develops after a while, but it tends to drag by now and I’m still not too sure how I feel about it. It definitely has its moments, so I’ll give KOKIA credit for that. Yes, finally something with a little more edge to it! Fate was used as the opening theme for the anime movie Break Blade and it has this kind of marching/battlefield style that I really like. KOKIA’s chanting in the song gives me goosebumps, her voice is at its best in this song. Close enough to epic perfection! Despite being another ballad, Omoi is actually quite interesting because of the depressing ambience and low strings playing a beautiful melody for KOKIA to sing to. Her voice is like a whisper, subtle and pretty. The only problem here is the length of the song, it’s just a bit too long because after about three to four minutes I’ve had it. Nageki no Oto features that lovely chanting in the background again, KOKIA just has the perfect voice for such vocal techniques and she sings in the perfect tone during the entire song. I’m so much more impressed by her vocals here in comparison to Omoi, while the music as quite a similar depressing approach as said song. Okay, by now it’s probably clear that I’m not too keen on too many ballads in a row. Yet Koto no wa manages to surprise me while still being a ballad, how is that possible you may ask. Well, the fact that this is the first song to actually have a wintery kind of feel to it and the arrangement sounds pretty interesting with the piano and strings with some soft percussion. KOKIA’s higher pitched voice is is very soothing too. A bit lenghty again though. Anata to Deatte is like Insonnia part II, a lullaby legato style. Just like Insonnia it’s pretty and that shouldn’t be forgotten, but I nearly fall asleep to songs like this one because it’s so sloooow. I miss the Italian too. Ooh, time for something more interesting with the mysterious and one of a kind song Road to Glory~for Dragon Nest White Version. It’s like a mix of Middle Eastern and Asian influences with the chanting, drums and erhu, a very edgy and impacting soun that I adore right from the start. There is no doubt that this is probably one of my favorite songs on the entire album! What weird names for the next two tracks. EXEC_REBIRTHIA=PROTOCOL/. is the first (both were used for Ar tornelico games) and it gives ‘epic’ a completely different meaning. I love how she opens the song with some extended high adlibbing (a bit opera-like actually) and sings in a deeper voice that suits her very well. This song is exactly what I needed, especially with Road to Glory surprising me the way it did. Love the bagpipes as well, very original! Okay, I express my deepest love for the ‘EXEC songs’ now. EXEC_COSMOFLIPS/. is bound to be played on repeat for the next couple of days. It has that same marching style that Fate had but even more appealing an it gives me so many goosebumps. Very suited for media, for sure. The layered vocals are the best I’ve heard on the entire album and I love how she apparently sings in Hymnnos, the fictional language in the games this was used for. Hands down, the absolute best. Hikari no Naka ni sounds like the perfect closing song for the album. Not completely a ballad, but it has some aspects of it. It has some punch because it has a little more tempo and the music swells as the song develops. I think this is another masterpiece on this album with a lot of attractive melodies and ofcourse, KOKIA herself is performing with top notch vocals again, very controlled. At first I thought this would be a little disaster, with all the ballad tracks in a row. I like some variation, as you probably know if you’ve read more of my reviews. Surprisingly enough, the second half of the album was almost completely made of masterpieces and, as it later turned out, absolute favorites of mine. I have loved KOKIA’s voice for as long as I can remember and I reviewed her Irish inspired album and ‘songbird’ a couple of years ago, but I never actually listened to more of her works. Now, thanks to this request (a succesful one I can tell you) I’m inspired to give it another go. One of my ‘discoveries’ of 2015: my newfound love for KOKIA! You’re welcome! Thanks for the compliment too. About that ‘little disaster’ thing; it had to do with the fact that I wasn’t completely blown away by the first couple of tracks after KARMA. I thought that the album would probably be a ballad album and usually I don’t care for that much. Luckily it turned around and I indeed like the album now! And Hikari no naka ni is from ar tonelico in one sequence that represents the love of one character for his loved one. I read on the lyrics of a wiki about that. Thanks for commenting! Also, thanks for clarifying that haha, I usually look it up in other reviews just so I can have a little more to say about the songs instead of just my opinion xD I’ll check your review out asap! I’ve known KOKIA from a couple of anime songs (I’m a HUGE fan of anime) and I really liked them. I recently heard songs from this album for the first time and I like her even more now. I’ve always loved bagpipes (not many people do haha! But, then again, I’ve always had a love for Ireland) and I fell in love with EXEC_REBIRTHIA=PROTOCOL/. Her voice is…I don’t even know if ‘amazing’ is good enough. Also, I hate it when people sing songs that don’t live up to their potential and vocals. She has songs that show her skill, that’s for sure, and I love that! Haha, listen to my going on and on :”) And here I was thinking I would be left speechless by KOKIA and Jade’s spot on review. Your completely right about her songs being just right to show off her potential, I noticed that too! I’ve also had a love for Ireland and the Irish music for as long as I can remember, so I really loved that concept album she did and I was thrilled to find some bagpipe influences on this album too! Thanks for commenting and for your compliment, too! I forgot to mention this in my last comment; but I actually liked “Anata to Deatte” I found it very soothing and relaxing, not boring at all, and also the best out of the all the slow songs, I don’t care which language it’s sung in. I especially like it towards the end. Also, I think I might prefer “REBIRTHIA” over “COSMOFLIPS” but I’m probably only one of the few that does. Huh? That’s strange, why is Mack before SHINee_Girl, didn’t she post first? I just noticed, that’s all. Please please review her Remember Me album! If you really want variation, it’s her absolute best imo. Please please!